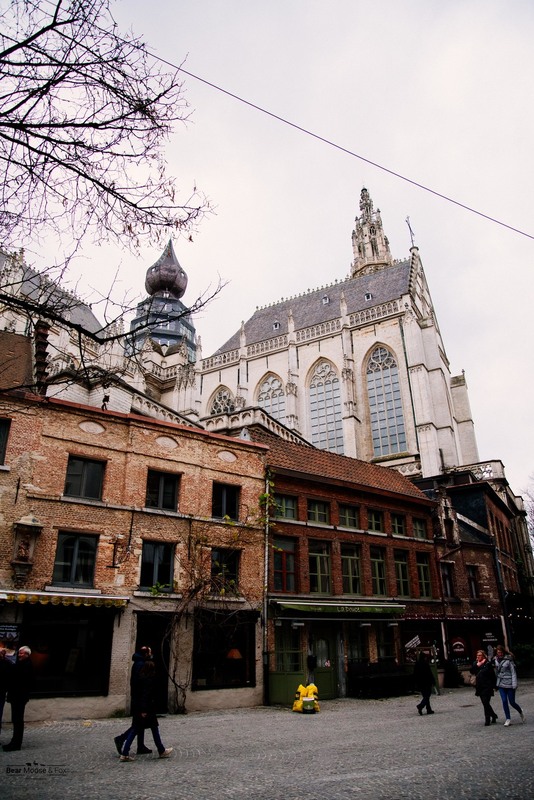 Belgium is undeniably a beautiful country where almost any city you go to has something wonderful to offer. Even if it's hidden on your route to another destination. And as it may be we discovered a Belgian chocolate factory (no lines or entry fees) on our way to the city of Ghent. Stocked up on more chocolate then one can carry and with some hot chocolate to warm us up on the inside, we drove for an hour towards Brussels, to a place that our guide book described as a beautiful but quaint town with less tourists and more to see than Brugge. Boy or boy, was the guide book wrong. As we drove on the outskirts of the city we realized it is nothing close to being small and very soon we started to notice less and less available parking. The traffic situation reminded me a lot of a busy metropolitan area except with a ton of people with absolute disregard for cars. In search for a garage that our GPS was taking us to, I made a wrong turn and ended up right in the middle of a pedestrian zone in the old town with thousands of people flowing in each direction leaving no place for the car to move. Panic set in pretty fast, as I couldn't continue to drive and we were told to try and turn around before we got stopped by the police. Almost ready to drive back to where we came from, we stumbled upon a free parking lot by a Volksklinik that greeted us with one and only free parking space. This was probably the only area with available parking during this festive season that is within walking distance from the old town. 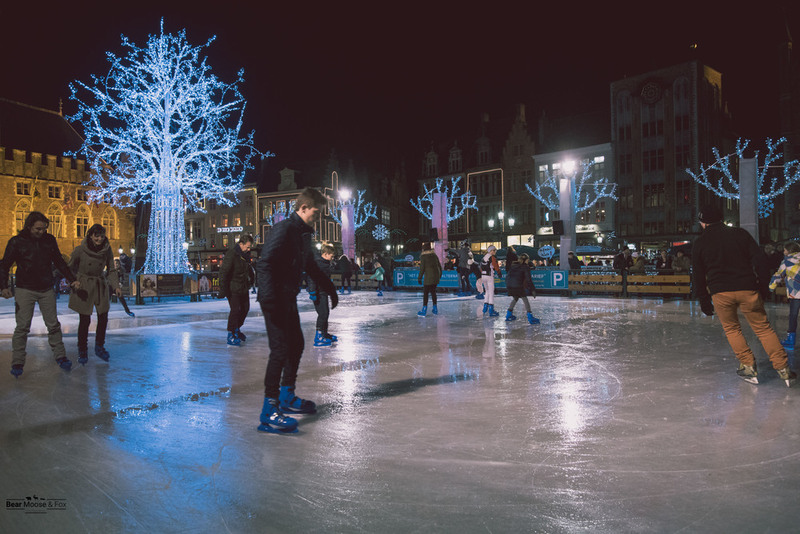 When finally on foot, Ghent opened its arms to us in a shape of beautiful Gothic buildings and cobble stone roads. Crowded with people, dogs, vendor booth, and everyone seemed to be in a cheery, holiday mood. 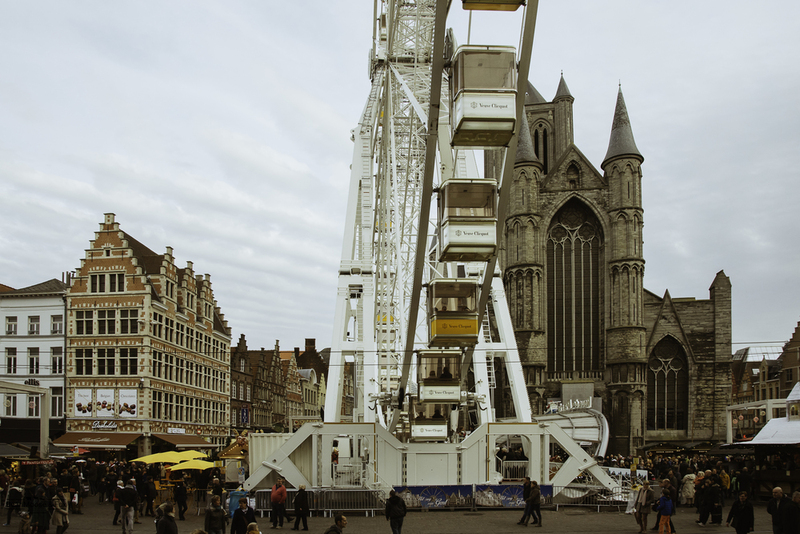 We had a fantastic walk through the city center, purchased Belgian beer, had a waffle, and soon came the time for us to head back, as it was starting to get darker and colder, and we still had Brugge to explore. Looking forward to some hot chocolate and flemish food, we started making our way back to the hotel. 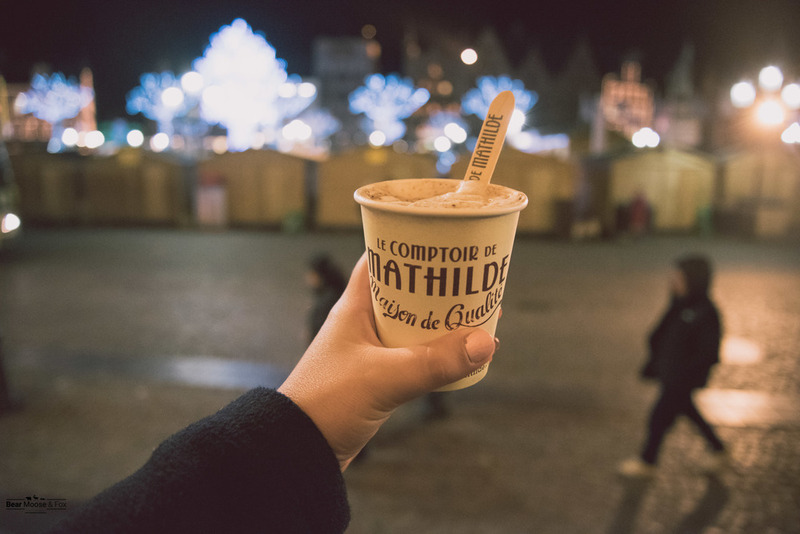 On our first day's walk in Brugge we discovered a chocolaterie called Le Comptoir de Mathilde that I was dying to to get back to. Everything seemed so amusing! The bars of chocolate laying behind glass, the instant hot chocolate that looks like a popsicle, the labels that I, being a graphic designer, just couldn't pass by. Finally we were back and I got my wish granted! The store is a literal candy land for children and adults alike. I have never seen or tried chocolate in ways that this store has offered (chocolate with cayenne pepper or hazelnut spread with sparkling sugar). 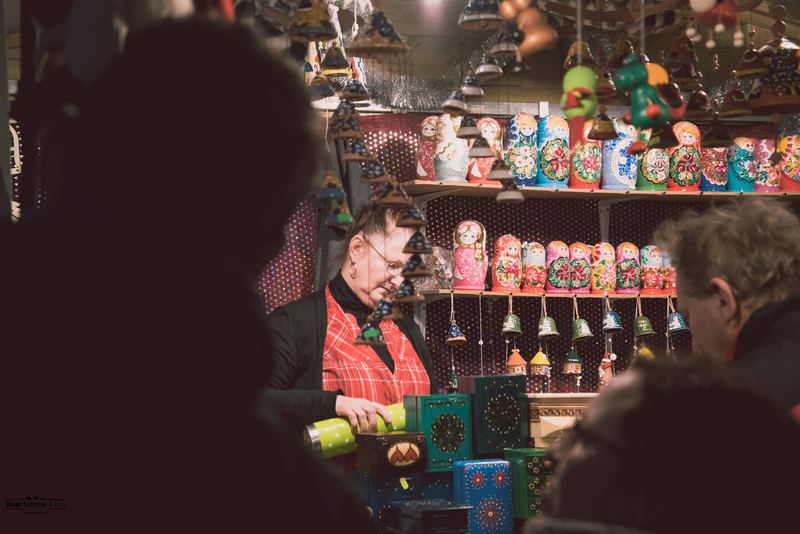 We stocked up on as many original flavors of hot chocolate as we could carry and with a cup each, headed out to continue strolling through the cobblestone streets of the evening Brugge with it's beautiful Belfry, canals and medieval buildings. 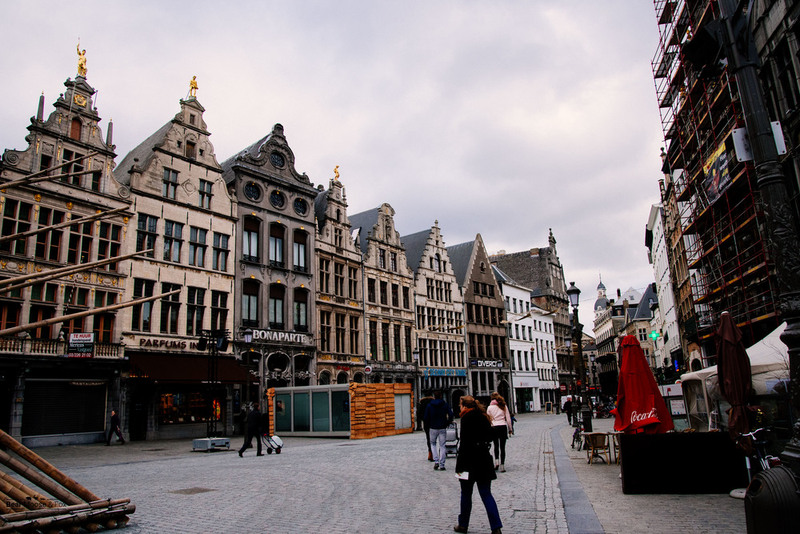 Our last full day in Belgium we decided to spend in Antwerp - the inspiration behind this trip. 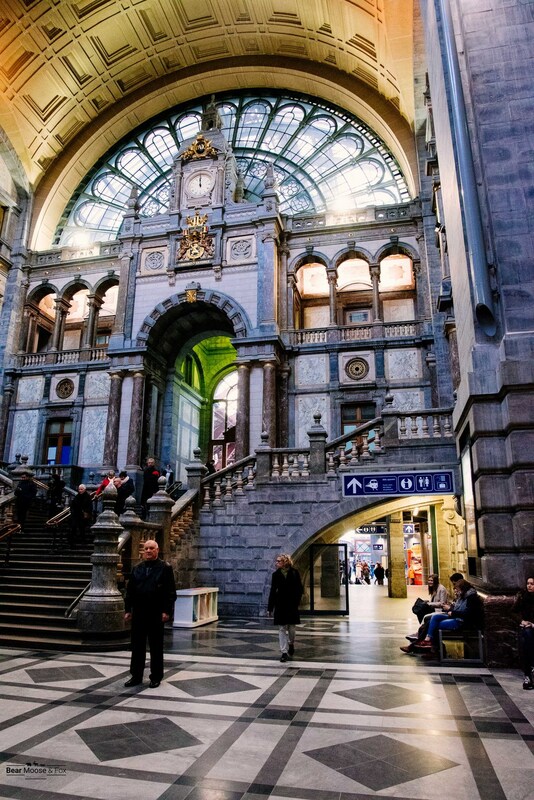 Learning from our experience, we opted to take the Belgian rail, instead of driving, and we did not regret it. A ticket there and back, upon presentation of our IDs, was only 11 euros, and unlike Germany, everything was simple. 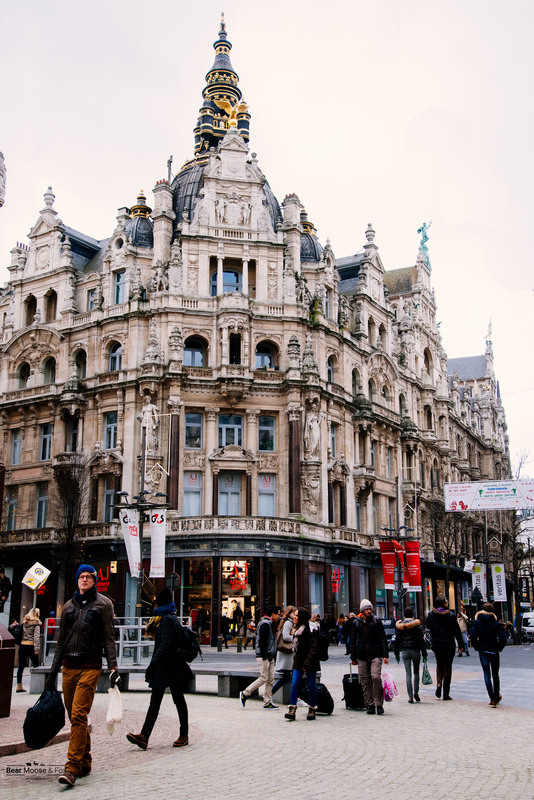 From the parking in the train station's garage, to the ticket purchase, train ride, and a walk through the city of Antwerp - everything was so easy to navigate. 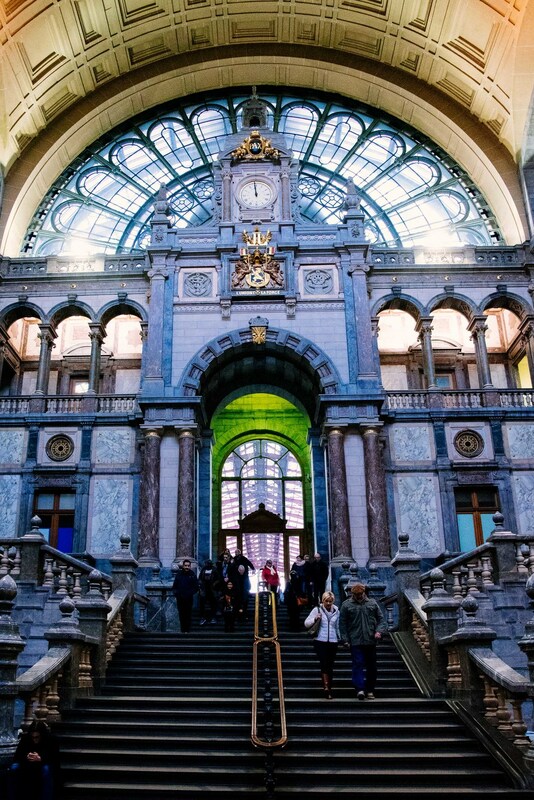 The first impression of Antwerp is of course formed at it's main station Antwerpen-Centraal - a grand and beautiful building that is a gem in the train station world, one of a kind example of Belgian architecture. Then we walked the main shopping street that fascinated us with it's monumental buildings, like giants hanging over us. 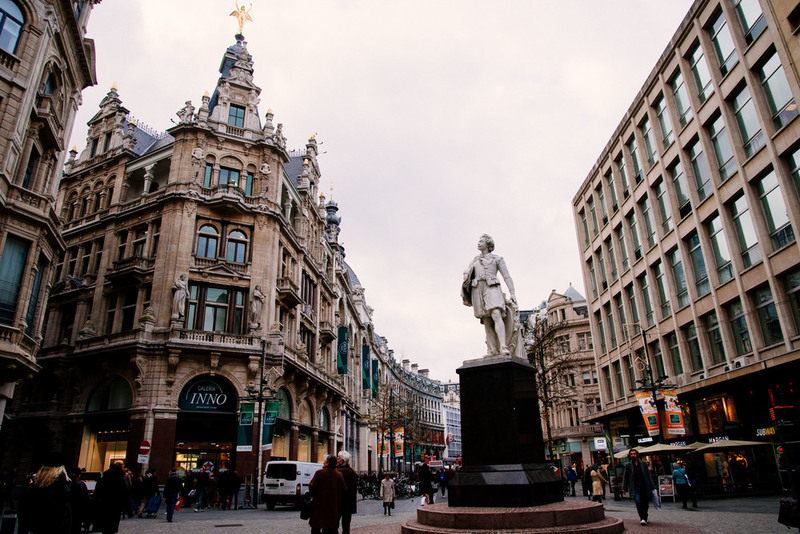 Speaking of giants - the name Antwerpen comes from an old legend about a boy Silvus Brabo, who cut off the hand of a giant Antigoon, that stood in the middle of the Scheldt river taxing the ships that came into town, and threw his hand into the river. Ant - werpen comes from the Dutch hand werpen, and means to throw the hand. 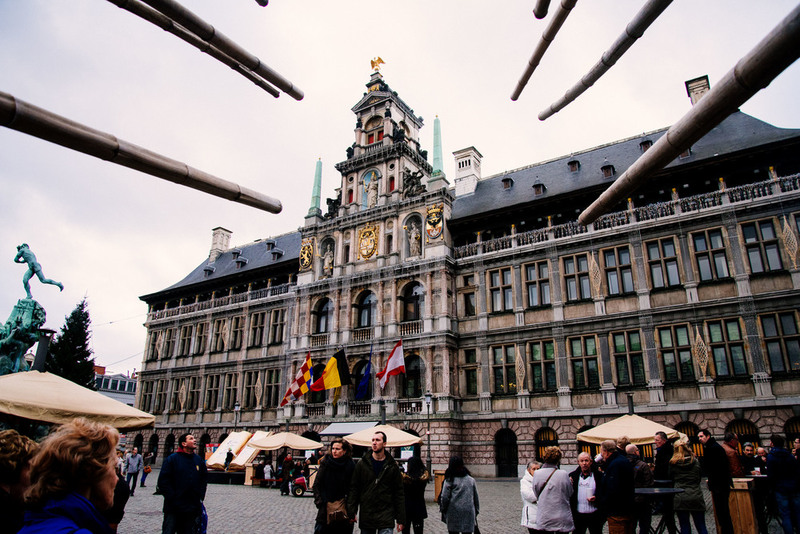 As we walked to the Grote Markt we were mesmerized by the beauty of the Cathedral of Our Lady (which is famous for its triptych works of Rubens), the guild houses and the City Hall. 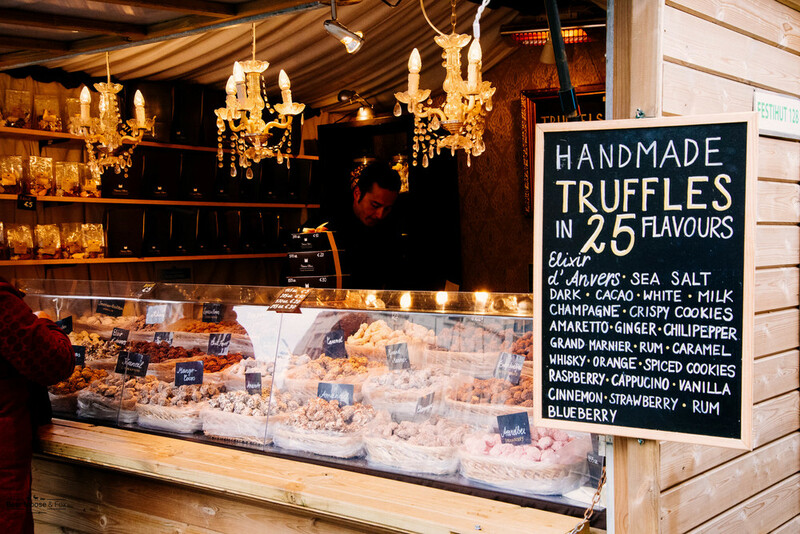 The christmas market was situated right in the middle of the Grote Market and of course we couldn't miss the chance to have a Belgian waffle, that even without any add-ons, tasted like the best waffle I ever had. Deep down I wish we had more time to explore this wonderful city, but after a few hours it was time to head back to Brugge, pack our things, and prepare for an 8 hour drive back home.